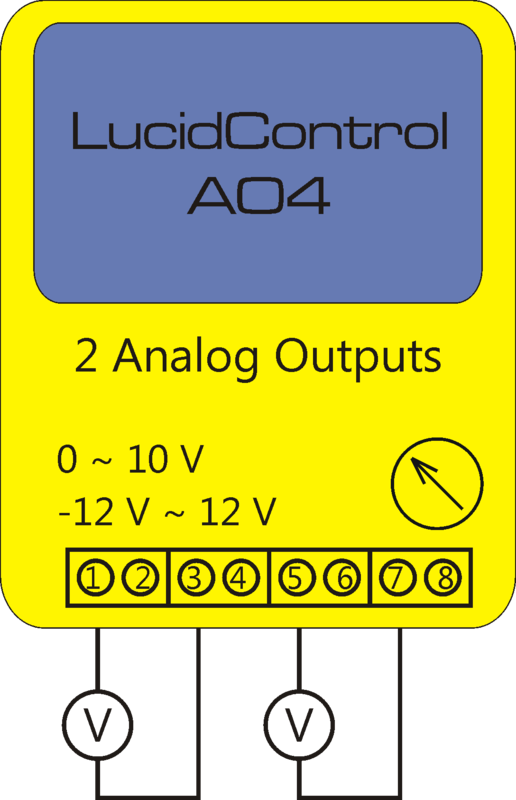 Our LucidControl Analog Output Module provides you with 4 programmable analog voltage sources. These voltages have all a common ground which is electrically connected to the ground of the host computer. In most cases this is acceptable but in some situations you may wish to have voltage sources which are independent and do not share a common ground. This article explains how to generate floating voltage outputs and it shows also how the new Analog Output Module AO4-12S can be used in order to generate two independent -24V ~ 24V programmable voltage sources. The two pictures above show different applications of the analog voltage output modules. In the left picture, the module is used in order to generate 4 grounded programmable voltage sources where the terminals 2, 4, 6 and 8 are internally connected with the common ground of the host computer. This is the standard configuration which covers most applications. If a common ground is not desired (e.g. in order to avoid interference), the analog output module is able to generate 2 floating voltage sources without relation to ground. Each of the 4 voltage sources has a potential against ground and hence they have a potential against each other (e.g. terminal 1 to 3). This means that the voltage between the terminals 1, 3, 5 and 7 can be measured without relation to ground like it is shown in the right picture. In the configuration above it is recommended to set the programmable voltage output channel 1 (terminal 3) to 0V output. With the programmable voltage output channel 0 the output voltage can be set between minimum and maximum voltage. The new launched AO4-12S module generates 4 voltages in the range of -12V to +12V from a standard USB port without any additional power supplies. The method explained as floating voltage outputs can be applied to this module also. 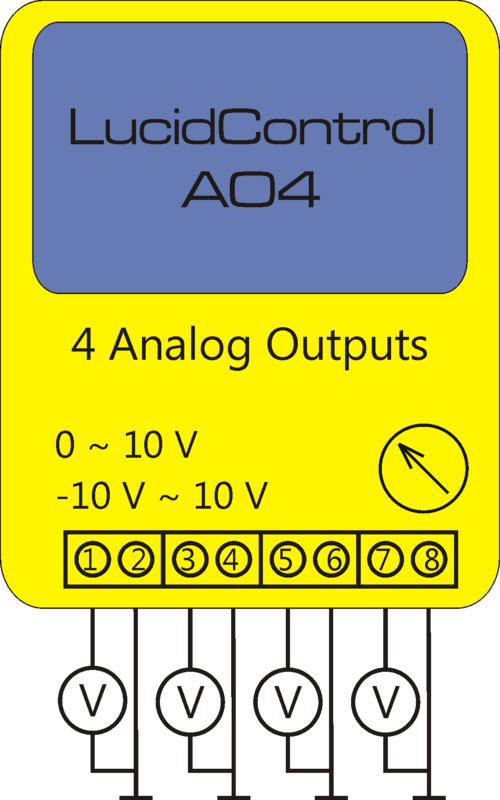 Moreover, it is interesting that the AO4-12S module with symmetrically (positive and negative) voltage outputs can be used to generate voltages between -24V and +24V without a relation to ground. Assume that the programmable voltage channel 0 is set to +12V and the programmable voltage channel 1 is set to -12V the voltage between the terminals 1 and 3 is +24V. Setting channel 0 to -12V and channel 1 to +12V results in a voltage of -24V between the terminals. 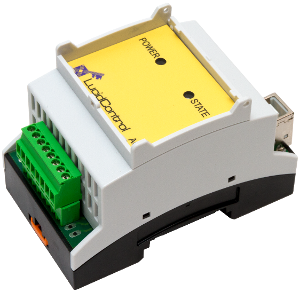 Shipping costs are relevant, especially for reasonable priced products like our LucidControl USB IO modules. Because of this, we decided to reduce the freight costs in our online shop to a minimum. From now on, shipping to European countries is as low as € 12.50. For countries outside of Europe we will charge not more than € 18.50 including packing and freight. More information about the expected delivery times can be found on our frequently asked questions page. If you have some special shipping requirements please contact us in advance.